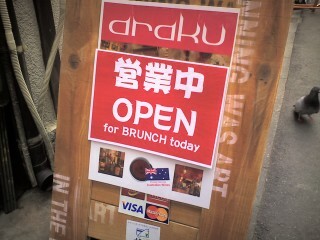 the Keitai Goddess : Brunch today! We are open today. Come on down and let Kristen and I cook for you. Golden Gai craft market today. Next entry: Tokyo Made - coolest stuff ever! Previous entry: The things people do! I would so love to come…. Love to you all! oh poo we missed out on everything this weekend!! Congrats on opening up! Were the Zous and Sabre present for the grand unveiling? Did they help out by serving peanuts? How often will this interesting event occur? It could be a great idea - a Devonshire tea of scones and cream would be very creative. It was not well patronised unfortunately. The market was in the two streets away from ours so we didn’t get much traffic. And people were not willing to come inside on such a gorgeous day. Felix - the Zous parents were there but Sabre stayed at home keeping TuTu happy.